Koh Chang is quickly becoming one of Thailand’s popular holiday destinations, with its tropical surroundings, coral reefs and superb scenery it provides for a memorable fishing holiday. 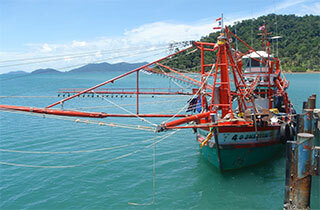 Koh Chang's waters are home to a verity of fish; barracuda, snapper, cobia, mackerel, grouper, gar & ray to name a few. Thai people fished in these waters for years and our experienced crews know just where to take the boat to give you the opportunity to enjoy relaxed fishing with a great chance of catching some fish. 4 days, 3 nights accommodation at good quality resorts, return transfers, and some excellent fresh seafood food. Fishing Trips are 1 day time trip, 1 night time trip and a day fishing in the mangroves at Salak Khok. Sea Hunter Fishing Tours is undoubtedly the best fishing experience on Koh Chang. They Offer a first class service and include a delicious freshly caught seafood meal with seasoned fruit and drinks. Their boat the Julia White is 20 meters in length and 6 meters wide and is both a fishing and cruise boat combined. To ensure your safety she is equipped with the latest navigational gadgets, GPS fish finder and radio communications. Below is a typical package itinerary if it does not meet your requirements, please feel free to contact us and let us know your preference. In most cases, for a small surcharge, we will be able to customise the package to match your requirements.